Your Path to a Bachelor’s Degree Starts at NECC! Gen Ed Foundation: complete 34 credits in the Gen Ed Foundation courses. A2B +Commonwealth Commitment: attend college full time, earn your associate degree within two and a half years and your bachelor’s degree within two more years, and maintain a 3.0 GPA throughout the program. All three MassTransfer Pathways offer great savings and a guaranteed transfer of credits. You may also be eligible for additional savings and benefits as well as guaranteed university admission with a certain GPA. General Education courses are the foundation of your degree. All 28 Massachusetts undergraduate public campuses require some set of core classes to provide you with a well-rounded academic experience, and the MassTransfer Gen Ed Foundation is transferable to all of them. This set of 34 credits (exclusive of developmental coursework), when completed together with a 2.0 or higher GPA, fully transfer to any Massachusetts public higher education institution – even if you don’t have your associate degree. They satisfy the general education/distribution/core requirements at any other Massachusetts public higher education institution, with the receiving institution being able to add no more than six additional credits/two courses. Complete 34 credits before transferring and save an average of 11% on your bachelor’s degree. Learn more about the MassTransfer Gen Ed Foundation. When you complete your associate degree in an approved program, you will graduate with a minimum of 60 credit hours including the set of 34-credit general education foundation courses. Complete 60 credits before transferring and save an average of 28% on your bachelor’s degree. Learn more about the MassTransfer A2B Degree or search for eligible programs. A2B Degree students who attend full-time and earn a 3.00 GPA or higher also have the opportunity to participate in the Commonwealth Commitment. You must earn your associate degree within two and a half years and your bachelor’s degree within two more years. 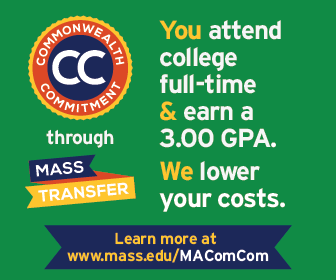 The Commonwealth Commitment to you is to provide a freeze on all tuition and mandatory fees on program entry and a 10% rebate off tuition and mandatory fees at the end of every successfully completed semester if you earn an associate degree and then transfer for a bachelor’s degree. As a result, you can save an average of 40% on the cost of a bachelor’s degree. “Transferring has been great and easy. Honestly, I think going to Northern Essex and then transferring to a four-year school is the way to go. You get a great education at a great cost. It’s an easy transition into a four-year college because NECC prepares you to be independent.” Read CJay’s story.